Lithium-ion batteries are mainly made up of four major components: anode material, cathode material, electrolyte, separator. 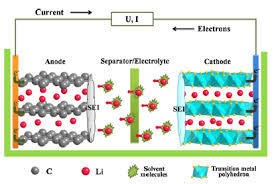 The electrolyte is one of the key raw materials of lithium-ion batteries, it is the “blood” of lithium ion batteries, between the battery positive and negative playing a role of transporting energy, guaranteeing the lithium-ion batteries to have high voltage, high specific energy and other advantages. It accounts for about 5% -12% of the cost of lithium-ion battery production costs. Usually the electrolyte is prepared by the high purity organic solvent, electrolyte, additive and other materials under certain conditions and certain proportion.